Everyone knows that women can not resist chocolate. Why should also, when it is so good. Axe Dark Temptation is a fragrance with subtle hints of chocolate that makes you just as irresistible. Men have the chance to underline his charisma right scent. In this respect, certainly not deprived: their self-confidence is the key to Axe. Women like men is fragrant. If they want is to attract, enchant and gain must themselves look and feel good, be confident - then it is easy to make that crucial first step and success is guaranteed! 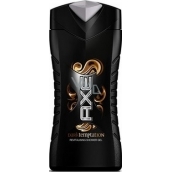 Like chocolate, women will not be able to forgive the new variant of Axe Dark Temptation. In addition to men seducing women especially chocolate, but since the new Axe Dark Temptation there is no doubt about what they can always prevail! Numerous studies have shown that for women is one of the biggest attractions in the world just chocolate. The reason is its creamy texture and delicious sweet taste. Her scent addition in our brain starts a physical process that causes it to suddenly feel fine. And just for these reasons Axe brand has developed a special exciting oriental fragrance that is a true innovation and novelty within the original series Axe deodorant. A new variant of Axe Dark Temptation causes that women desire men constantly "nibble" - actually no longer crave nothing else.